This easy, one-skillet frittata is a delicious and healthy way to use up any veggies, meats, herbs, and other leftovers you have hanging out in your fridge or pantry. Last weekend I got to spend a few days in beautiful Monument, Colorado catching up with some old friends at a tranquil lakeside rental house. On our first morning there, while sipping coffee on the porch, the ladies and I started formulating a plan for the day. Three of the four of us were excited to get outside and do a Crossfit-style workout. One of us wanted to stay inside and whip up a delicious breakfast. It’s probably not hard to guess which one was me. Sometimes the last thing I want to do on vacation is cook, but this type of cooking is my jam. No kids in sight, a beautiful view from the window, a well-stocked kitchen, and all the time in the world. 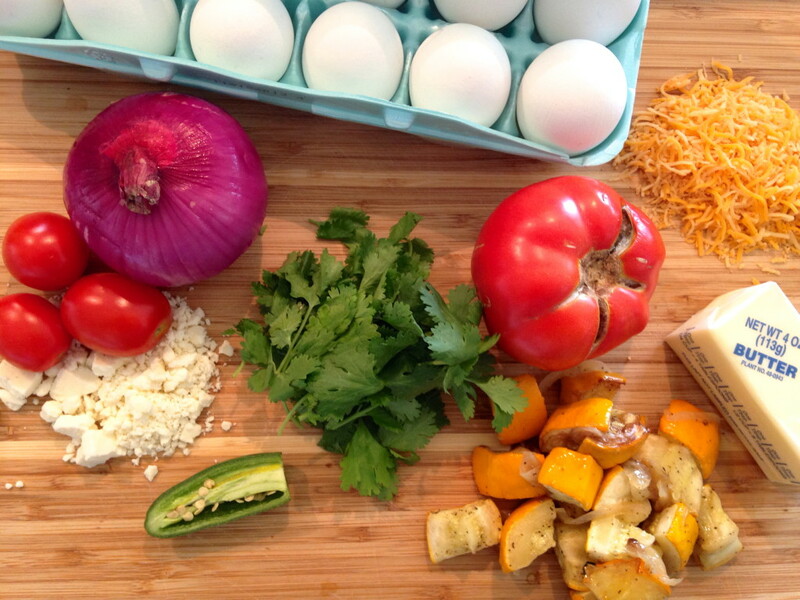 After a quick survey of the ingredients in the fridge — eggs, mushrooms, onion, zucchini, yellow and orange bell peppers, bacon, red onion and feta cheese — I knew I had the fixings for a great frittata. A frittata is one of my favorite things to make because it’s nutritious, it’s easy, and it’s a perfect way to use up leftover veggies, meats, greens, cheeses, herbs, and any other odds and ends in the fridge. My frittata was such a hit that I decided to make another one yesterday. I’m currently visiting my parents in Pennsylvania, and I was inspired by the garden-fresh herbs, home-grown tomatoes, and other ingredients that they had on hand. Using all of these things would’ve been overkill, so I spent a few minutes figuring out which ingredients would complement each other best. The way I saw it, there were three different directions I could go: a Mexican style frittata using the tomatoes, yellow squash, jalapeno, cilantro, mexican cheddar cheese and feta; an Italian style frittata with artichokes, tomatoes, fresh basil, shredded mozzarella, and parmesan; or a French style frittata using the ham, tomatoes, smoked gouda, and feta. I opted for the Mexican version this time around since I could use up the most ingredients. But this should show you how many possibilities you probably have lurking in your fridge! 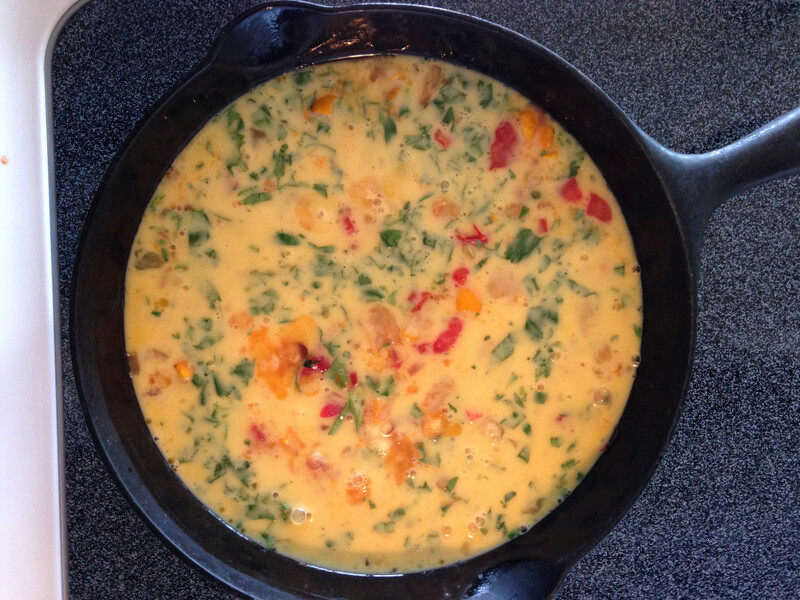 Next time you find yourself wondering what to make and/or with an overabundance of leftovers, get out some eggs, fire up your skillet, and make a frittata. You can get very creative when you’re making a “Purge the Fridge” Frittata, but some ingredients are more frittata-friendly than others. As I mentioned above, you don’t want to just throw in every single thing you find. Focus on flavors and ingredients that complement each other (ie: dill and salmon, basil and tomato, or cheddar and ham). 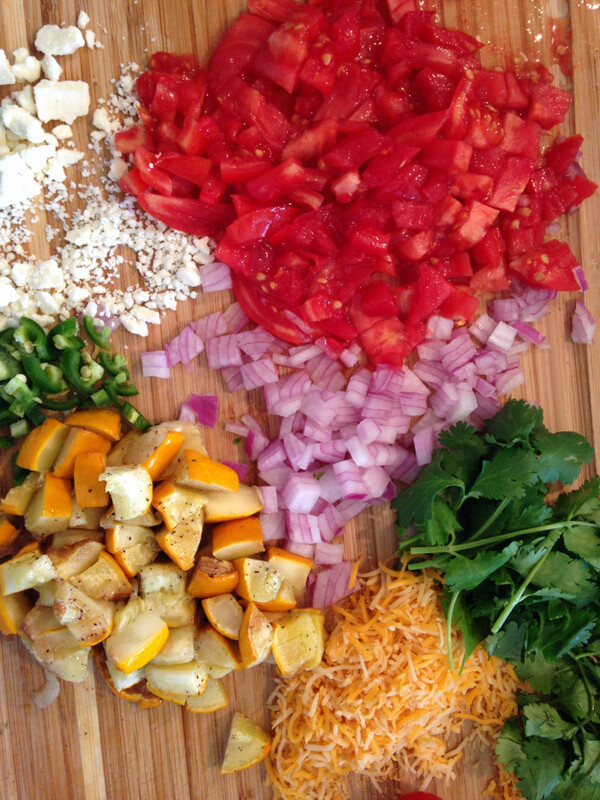 If you’re going to be using any meat or seafood in your frittata, pre-cook it, chop it, and set it aside. Add a generous amount of oil and/or butter to the bottom of a skillet (an oven-safe nonstick skillet works best). You want to coat the bottom of the pan to ensure that your eggs won’t stick when you add them later. Once you’ve determined which veggies you’re going to use, chop them up and figure out which ones will take the longest to cook. For instance, mushrooms and bell peppers take a while to get tender, while tomatoes and spinach cook up in minutes. I almost always start with onions (if I’m using them), and then add the other veggies according to cook time. 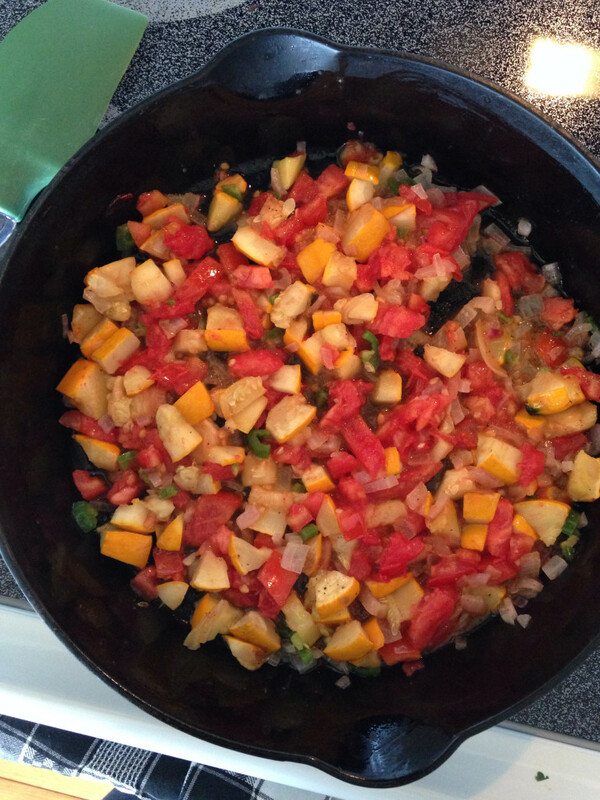 Add your first veggie group to the skillet and saute over medium-low heat until the veggies start to get tender. Keep adding your various veggies until everything is cooked to your liking. Sprinkle with some salt and pepper to taste, and then stir in any cooked meat or seafood you’d like to use. Spread cooked ingredients in an even layer on the bottom of the skillet (adding a little extra oil/butter if things are starting to stick), and move the skillet off of the heat while you prepare your eggs. In a medium-sized bowl, beat approximately 10 eggs (if you’re using a standard 10″ skillet). 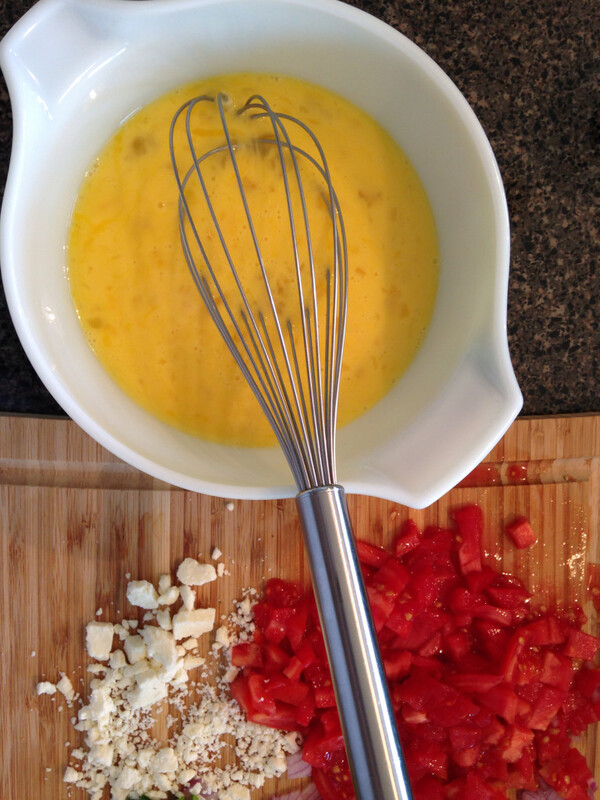 Add in splash of milk or half & half to the eggs to make them creamy. 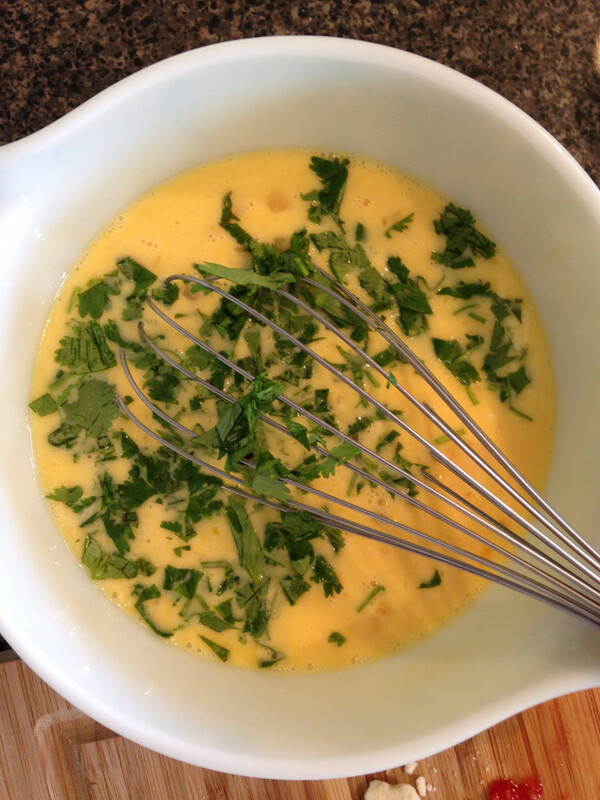 If you’re using herbs, stir the chopped herbs into the eggs. Return the skillet to the burner over medium heat and pour the egg mixture over top of the veggies and other ingredients. Do not stir. Transfer the skillet to the oven. 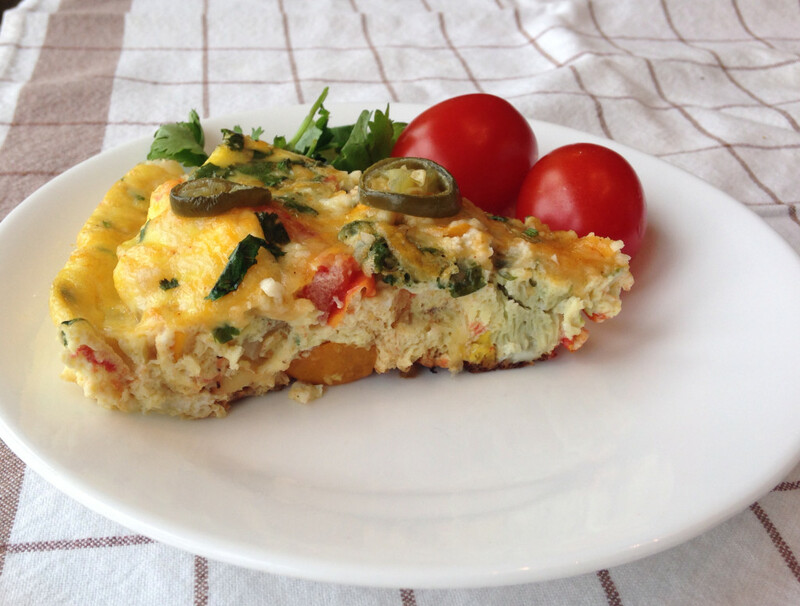 Bake at 350 degrees for approximately 15 minutes, or until you can tell the frittata is cooked all the way through. Let cool, slice and serve. What a great idea! 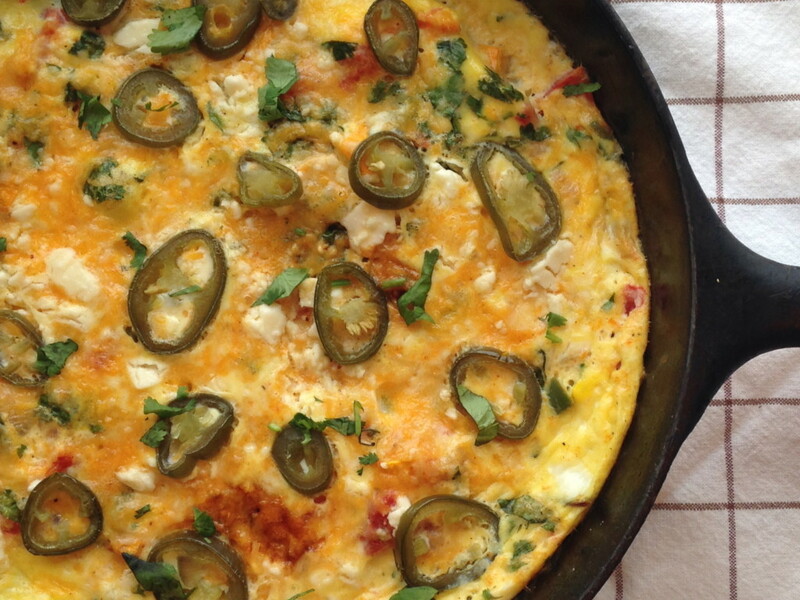 I need to try this… I have a new-ish cast iron that I have yet to make a frittata in.